75 Creative Card Challenges Blog Hop! 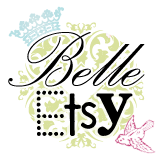 Time for a blog hop! 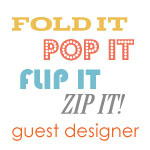 I’m so excited about this blog hop as I was so excited to work on this special issue from Paper Crafts Magazine. 75 Creative Card Challenges is one of those issues you are definitely not going to want to miss. It was a joy to work on and so inspiring. Looking through it’s fabulous designs and challenges, I’m inspired all over again. Seriously. The ideas are amazing! 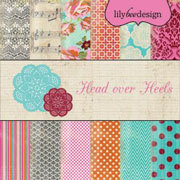 For today’s blog hop, a few of the designers have been asked to create a card for a new challenge. The challenge was to use song lyrics and I’ve used the Shine Bright song title as my sentiment and also incorporated lots of shiny and “diamond” accents. 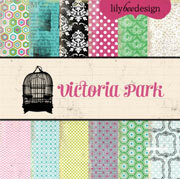 It was fun to go through my stash of things I’d been hoarding and put them all together into one glitzy design. Giving a nod to the idea of using lyrics is also using a sheet music motif in the Tissue Tape and also in the patterned paper used. Most great blog hops have a giveaway and this one is no exception! I’m thrilled to be able to send a copy of the new 75 Creative Card Challenges issue to one lucky winner. Please leave a comment on this blog post by 11 pm EST on Tuesday January 15th. for a chance to win! One comment per person please. I’ll be announcing the winner shortly after that. Good luck! This isn’t an issue to miss! For more chances to win, make sure you stop by each of these blogs for another chance to win. 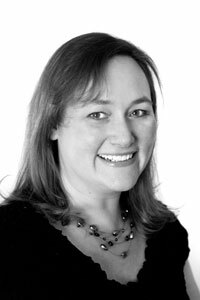 From here the next blog to hop to is Kim Hughes. Thanks so much for stopping by! Happy blog hopping! This entry was posted in Card Designs, Challenges. Bookmark the permalink. And the winner is… Rihanna! Gotta love that mega dose of bling. great card julia, the color tones really feel good with the sparkle of the bling. Julia, love the bling and the song too! Great lyrics and super card! Beautiful card, love the bling that is so perfect for the song 🙂 I’m sure this issue is amazing! LOVE the bling! and the tissue paper!!! and the music sheet! i just love this whole card! seriously – beautiful! Love the colors and the bling. Just the right amount of both. PRETTY! Love those colours, and the embellishments. 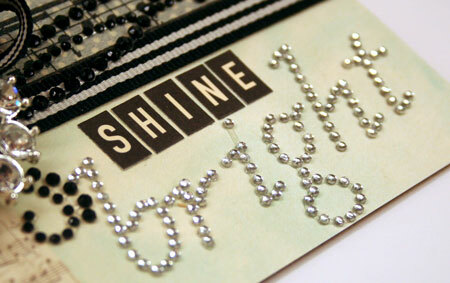 “Shine bright” indeed! Thank you for sharing. Love this card with the music tissue tape. Thanks for the inspiration and the chance to win. Your card is gorgeous! I love how you incorporated the sheet music and a little bling. Thanks for sharing your creativity! wow! Gorgeous!!! Lots of bling!! Love how you did the song title and your bling to go with it is so pretty! So pretty. Love it! Thanks for sharing! Beautiful card! 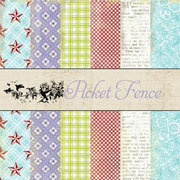 Love the vintage colors! LOVE all that bling on your card – beautiful card composition! The shiny accents are perfect with the sentiment. Beautiful card as always, the bling is so appropriate for the title of the song !!! Love all the bling! Super sentiment too. I may copy that! I could use this magazine , I am always looking for mojo to help me make a better card. This is why I follow your blog! Love how you combine several sheet music papers with the bling. The Paper Crafts magazine looks amazing too! Julia…love the black/brown/silver combination…it’s elegant. Thanks for sharing. Your card is gorgeous. Love the music notes and the bling. Your card is stunning with the color combo, musical tissue tape and bling. After seeing some of these challenges on papercraftsconnection.com, I know I need a copy of this magazine. Thanks for the chance to win, Julia! 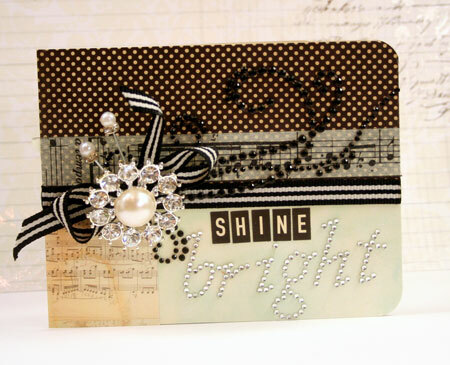 Great song, and I love all the bling you added to this pretty card! Thank you so much for a chance to win a copy of this special issue! Absolutely gorgeous! Love all the bling. So flippin Cute. Those are my favorite colors to work with. Very inspiring and great Lyric idea!! Plus my daughters sorority uses “Shine Bright” as a tag line..it’s everywhere around here!! Wow this is so pretty–love your colors and all the bling! Love all the glitz! I love the idea of a song-inspired card. Love this song and this card is a perfect for it. Washi really makes it pop with all that sparkle. Fantastic card…love the colors and all that bling!! Never enough bling. Love it! Such a classy looking card. Love it. Great card–love all the bling. Nice song choice! I wouldn’t have thought to make a card based on that song, but it really works. VERY classy card! Beautiful! Thanks for sharing and for the chance to win! What a beautiful card! Great take on the challenge! pretty card… love the sparkle! Well I have to say that is the first song that I haven’t been familiar with but you did make a lovely card from it! Love the rhinestones and the color scheme. Oh What a gorgeous card Julia. What a gorgeous and elegant card!!! Thanks for sharing your inspiring card! I always love a little bling on a card! Oh how bright! Great card = smiles. oh love your card design…the embellishments are great! However, NOW I can’t get that song out of my head!!!!! Loving all the bling and that musical tissue tape is awesome! love the color combo and all the bling. thanks for sharing. This is a really neat card. I love the shiny bling! Very cute! Love the bling! Love this design, and how you incorporated a music motif into your song-inspired card. If the hop cards are any indication, this is definitely one inspiring issue! Wow, love the use of the word and bling. Thanks for sharing. I’m not I familiar with that song, but I totally love your card! Julia, your card is so classy. I just love it and your use of music paper,etc. Thanks for the inspiration. Would really love to win what looks like an incredible issue. Thanks for the chance. Beautiful card! I love the bling. 😀 Thanks for the inspiration and the chance to win this new special edition. Very classy! The colours are so beautiful and the bling adds that extra special something! I can think of so many lyrics to use on a card right now! That will probably change when I sit down to do it though! This issue has got to be one of the most fun & interesting ones! I know I want it!!! I love this. It’s so elegant. What amazing work! Love all the bling! Beautiful!! Love all that bling on your card. I don’t know this song, but I love the card. One of my fave color schemes. I’m going to have to Google the song, but I love your interpretation. Maybe it’s one of those songs that I don’t know by name but will know by the lyrics. Oh, to have a bunch of appropriate bling just lying around begging to be used–ha! I like the neutral colors with the glitz. Very nicely done! I´m a huge lover of all bling, so this is just so me. I just love your card, so beautiful and so saying. BLING! BLING! and more BLING! I just LOVE this card! The color combinations you used were gorgeous together. I am going to have to get out my bling and try some of these things for myself. Thanks for the great ideas! Nice use of many items in your stash. as always…wonderful card. thank you for sharing. Beautiful card and song lyric combo! God bless! I LOVE this! All of the bling is beautifully done without looking gaudy and I LOVE using lyrics! Great card. So bright and appropriate to the song title. This is so pretty! LOVE the vintage feel!!! Your card shines! Thanks for sharing! What a lovely card! Great job with the challenge! Love the way you use the hat pins on your cards. Great job on the challenge. Julia, your card shines bright like a diamond — very pretty! Thanks for sharing. Such a beautiful card, I love the colors you chose and the bling is right on! What a wonderful, glitzy card! So pretty – love the bling! Wow! What an amazing combination of embellishments, Julia! Gorgeous design! Gorgeous card. Love the bling and tissue tape! Bling to go with a song sang by a bling lover!!! great card love the bling! Wonderfully fun inspiration, Julia. Thanks for sharing and the chance to win. I’m hopping along! Can’t wait to see this edition. I always enjoy your delightful cards, Julia! For being a neutral colors-only card, yours is very bright and lively! The music notes pattern does a great job of driving the song theme home. Wow what a fabulous card! Love everything about it! Great Card! I like the fact you incoporated new music into your theme, very cool! Thanks for the chance to win! The bling is just amazing and very fitting! Love that gorgeous bling, especially that starburst piece! Great card, great song! How pretty! Love the bling with the colors! Great card! Love all the bling on your elegant card! Thanks for the chance to win. Who won your seasons giving blog hop? Love how your embellishments add to your song title.